← One can dream… my perfect job! Below: This is the first piece of writing and what a great place to for this student to start. This child has begun to draw some shapes and was able to talk about the picture. This is imitating writing. There are what looks like some strings of letters and a picture which isn’t shown. 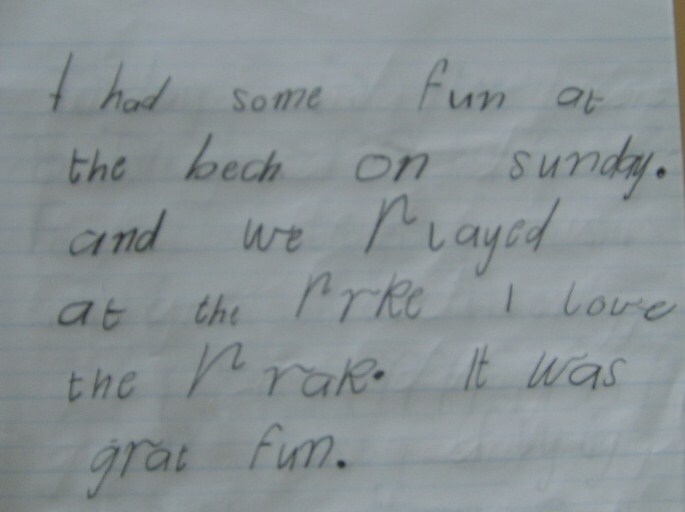 The child knows that writing is written down and has been a real risk taker by having a go. This is certainly something to celebrate. Below: This student is now using some letters which match sounds. Sometimes whole words are represented by the first letter. Common sight words can be seen and this child was able to read back there writing at the time of writing. 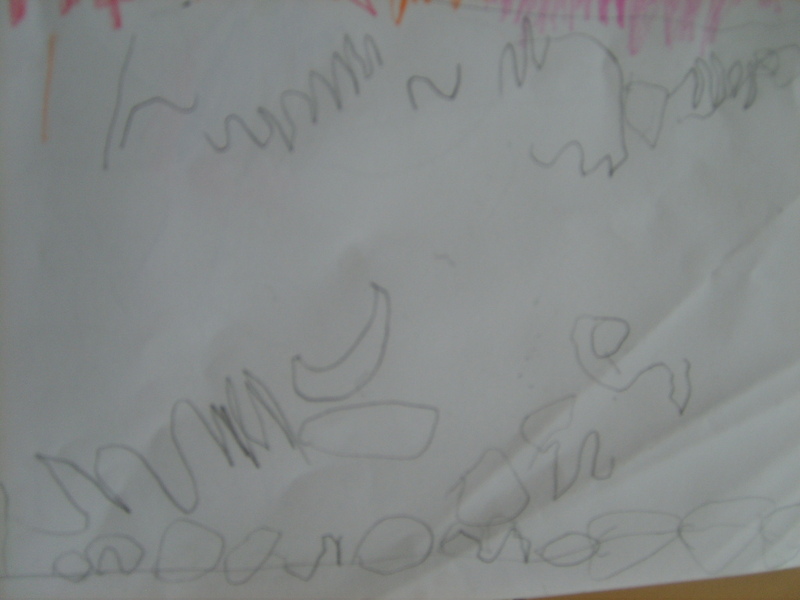 Below: This student is now beginning to write words with beginning and end sounds in place. Some high frequency words are spelt correctly. Vowels can be seen in words, but they are not always the correct ones. There is a mix of lower and upper case letters evident, however, I can clearly see words and can read this sentence quite easily. The concept of a sentence having a capital letter and full stop is not yet in place. 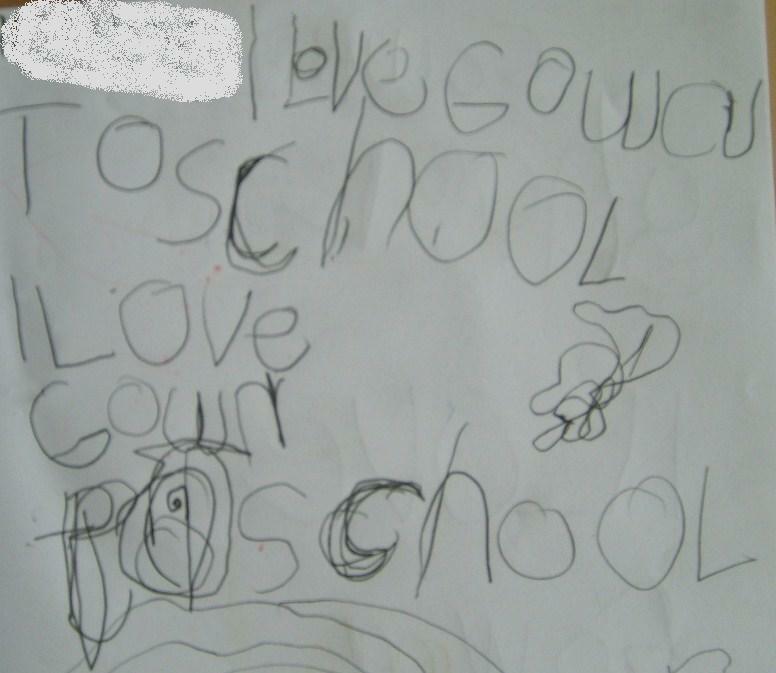 Below: This student is now writing words the way they sound. The student’s known sight vocabulary is developing and this is evident in this writing sample. The concept of writing from left to write is not in place. There is still a mix of capital and lower case letters evident. This child’s phoneme knowledge is developing well. Strategies such as stretching out words are being used well. Below: Spaces and the concept of left to right is not in place, however, this student is well on the way to becoming a capable beginning writer. There are some wonderful attempts at spelling unknown words i.e. party and weekend. 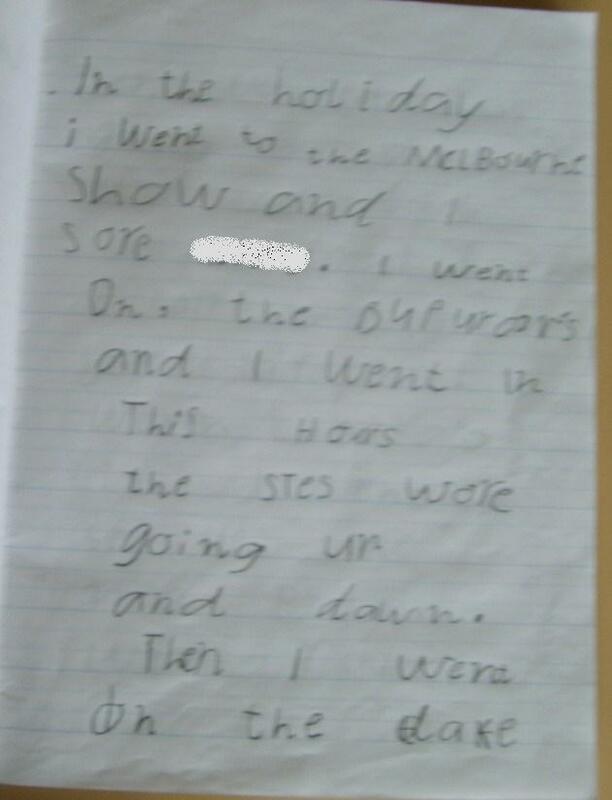 Fullstops and capital letters still need to transfer to this child’s writing from explicit teaching sessions. Using Interactive Writing sessions is a great time to focus on these progression points. Below: This student is beginning to leave spaces between words and is spelling many high frequency words correctly. Capital letters and full stops are not evident yet. Left to right is developing well and the correct use of upper case letters and lower case letters is developing. 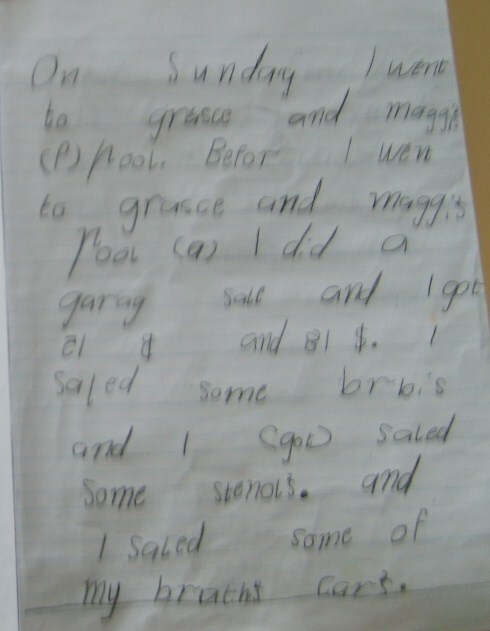 I can easily read this child’s writing and the student is able to read their writing at the time of writing and at a later time. Below: This student is now using simple punctuation marks. More than one sentence is written, however, left to right recording is not established when composing a longer text. 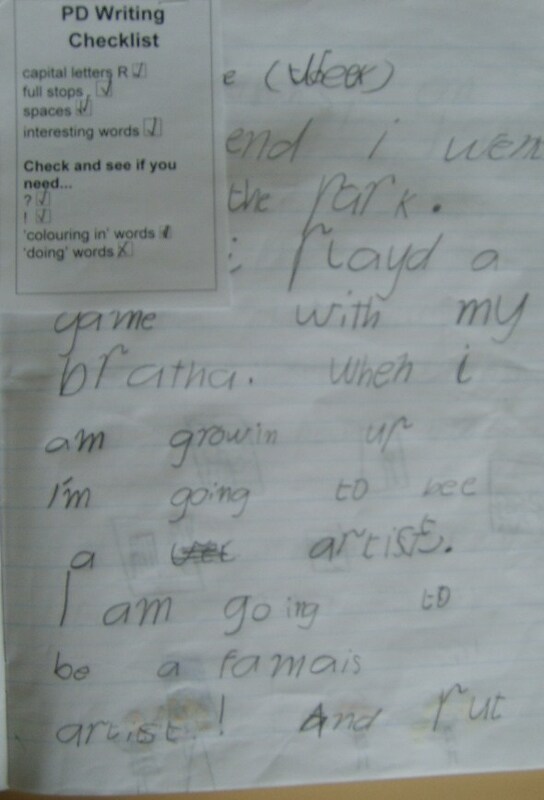 This writing piece includes lots of information and can be read back at the time of writing. Written literacy skills are developing well. I have found that writing control lessens when children start composing extended recounts. The task of writing down their thoughts overtakes their attention to detail. Full stops are evident and this student is totally engaged in the writing process. Below: The student’s writing has refined again. Left to right recording is evident. Spaces are developing, although this is hampered by large letter formations. Capital letters and full stops are being used correctly. Vowel sounds are being used correctly, ‘sh’ is established, some capitals letters are inserted incorrectly and the magic ‘e’ is known. This student’s writing displays the transfer of explicit teaching into text. The student now displays control when composing a longer text. Below: Using a simple plan to scaffold sequencing has been introduced. Good attempts at spelling unknown words are being made, spaces are used correctly between words as well as simple punctuation. This student’s writing is developing well. Content is relevant to the plan. Letter formation is developing well and letters are placed on lines. 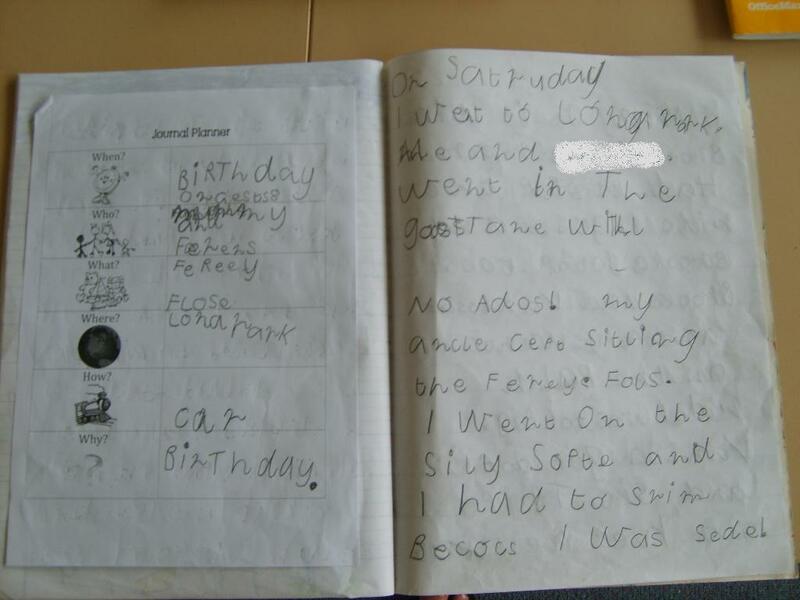 Below: The writing below has been sequenced well and follows the simple recount planner developed with the children. Capital letters are evident, letter formation is developing well and self corrections are made. 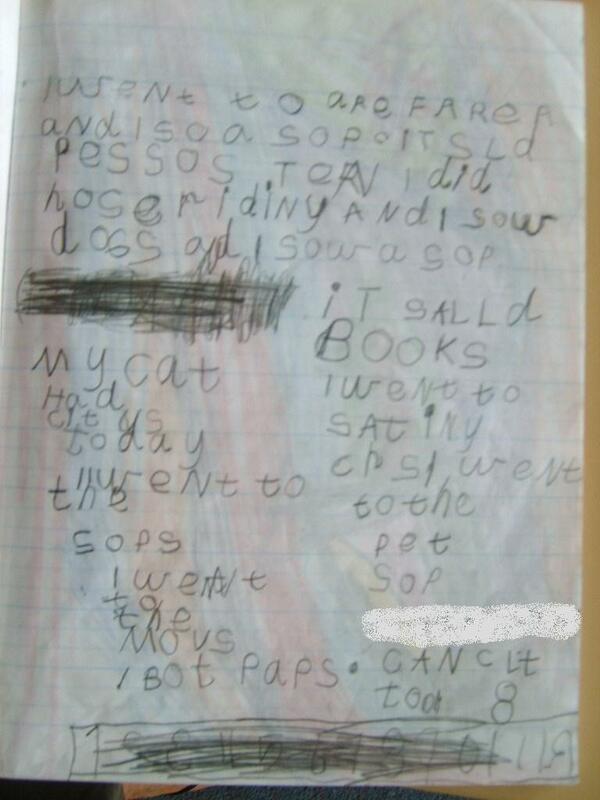 This is an impressive piece of writing for such a young child. Below: This child can spell most words correctly, however, phonetic spelling is still being used for more complex vocabulary. Punctuation marks are being used correctly most of the time. Capital letters and lower case letters are in the correct place. This child is writing two to three pages of reasonably well sequenced writing. The child is still representing the word I as (i). Sometimes I just have to wait for the transfer of explicit teaching into a student’s writing. It’s better to wait, rather than push a teaching point. ‘Going deep’ and ensuring new learning is connected to prior understanding is crucial for young writers. I want the transfer of explicit progression points to be meaningful for the child. I also want the student to be able to articulate their learning. Below: The student is now reviewing their writing after the draft stage. A checklist developed by the children after looking extensively at good writing samples is being used to check and change their writing. Endings such as ‘ed’ need to be taught explicitly. Using a checklist developed by students is a great writing scaffold tool, but it must be developed after a student inquiry into what good writing looks like and needs. Below: The editing checklist is now a natural part of the writing process. In fact, the concept of writing as a process in now embedded. The use of a small (i) for the word ‘I’ is a common error across the grade and was dealt with in a number of explicit teaching focus sessions. The use of ‘ing’ is evident and sentences are informative and well-formed. 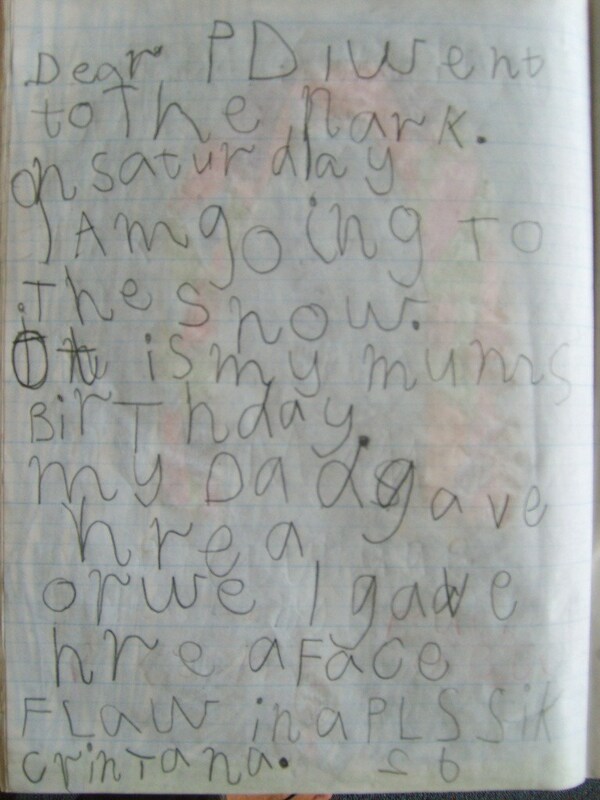 The child continues to write 3-4 pages and loving being an author. 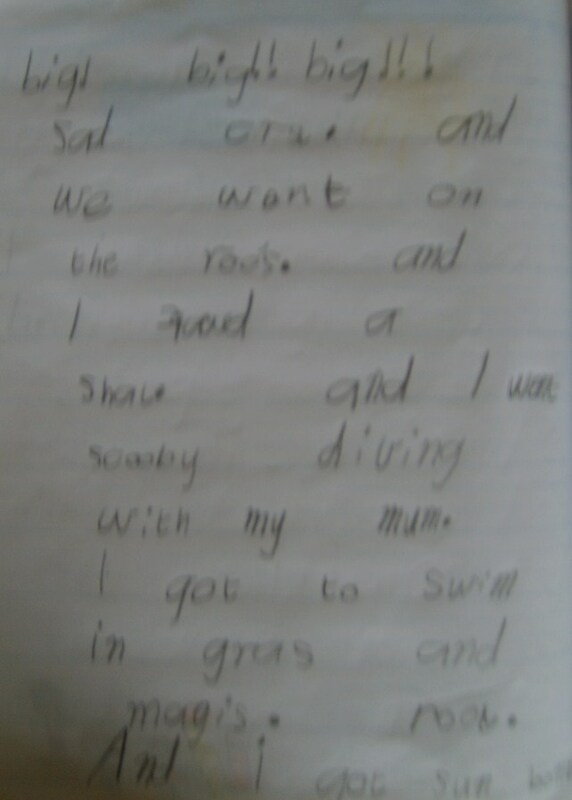 This child has now developed a passion for writing and that’s special! Below: Joining words were introduced in a series of explicit teaching sessions and are being used, although not correctly. Exclamation marks or ‘yelling marks’ have been used to place emphasis. Common sight words are spelt correctly most of the time with some more complex words spelt correctly. The use of ‘sh’ to represent the final sound in a word is now being used correctly. ‘Th’ is established and used at the beginning of words. The student is now building their knowledge and skills quickly. New knowledge and old knowledge combine to form new understandings at a rapid rate. 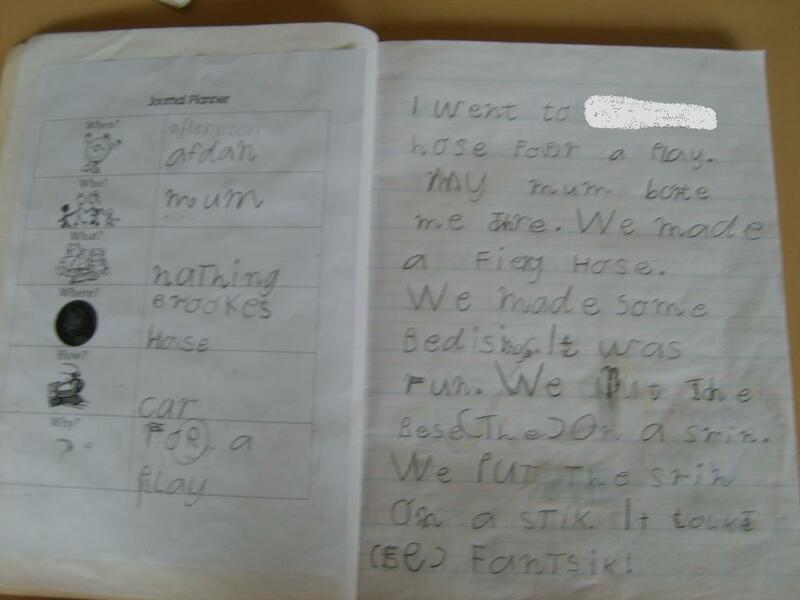 Guided Writing is a great strategy to use with this student at this stage to address individual learning needs. Below: Writing is progressing well and explicit teaching is transferring to writing. The child is now able to direct their learning needs and will be asked to present ideas for a focus session. 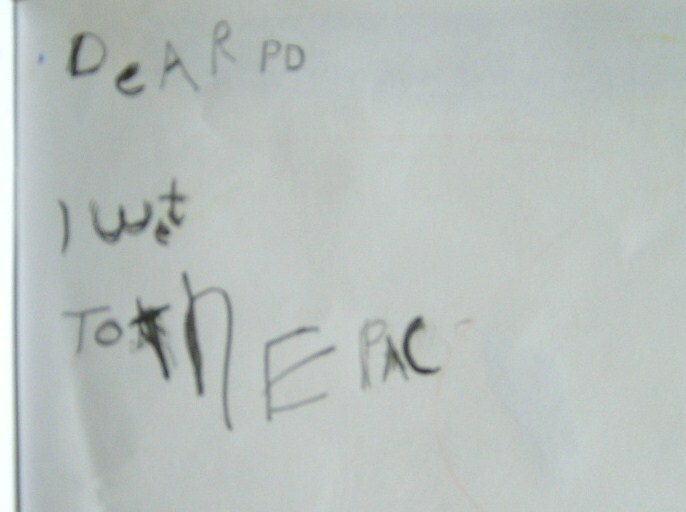 Below: This child’s letter formation is developing well, with letters being placed on the line. The word ‘and’ is still used as a joining word incorrectly at times, but overall this student has made wonderful progress. The letter ‘p’ needs to sit properly on the line and this will be dealt with formerly with all students. 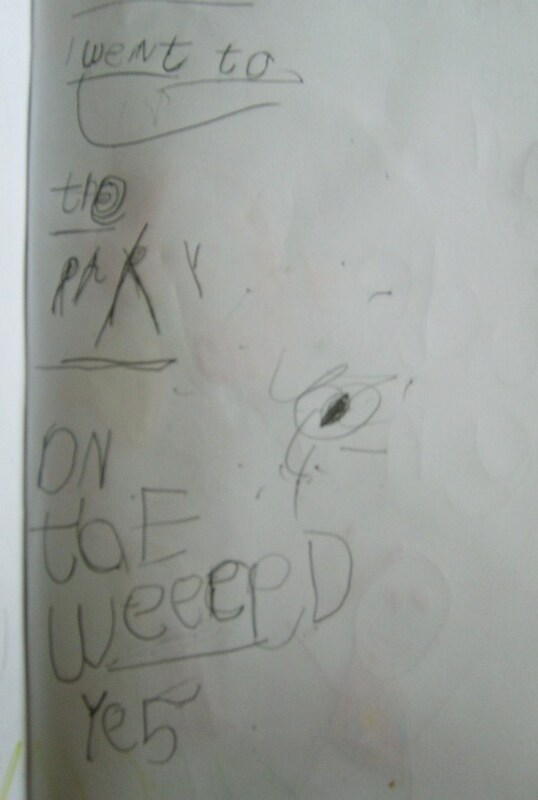 I am very pleased with this child’s writing development. I can see many teaching points which I will need to include next week in explicit teaching sessions. We’ll be looking at joining words again because the use of joining words isn’t embedded in this child’s practice. A number of students are using joining words correctly within their complex sentences. Guided Writing addressing individual needs is my strategy of choice. There are four weeks left for this child in my grade and then this student’s first year of formal learning in Australia will be complete. Using the strategies outlined in this post/blog in a Language Experience classroom enables children to engage in authentic and meaningful learning. Building oral language is also crucial to writing and reading. Children need to be constantly introduced to new vocabulary. Extensive research tells us that students with poor oral language find the journey into literacy a lot tougher. I’ll be adding more to this post from time to time as I reflect on my teaching and learning. There are so many areas I need to review in terms of my teaching, but it’s this very aspect of teaching that keeps me enthused and motivated. I’ll be speaking to parents as part of our transition program in a couple of weeks. I’ll be touching on reading and writing, however, this year I’m taking this opportunity to talk about ‘oral language’, Language Experience and how children learn-making connections etc. Next year, we’ll have parent evenings devoted to literacy. Parents have found our talks in previous years a little overwelming. And thanks for commenting. If you email me I can share some great resources with you. I’m in an ‘eat or delete’ club. We share and if we like it we keep it, if not we delete it. I’m not sure if I’m in Prep next year as we haven’t been told yet. I’m glad your info session went well. Sounds like we are on the same wave when it comes to teaching. I’m a Prep teacher in the South Eastern suburbs of Melbourne and have just discovered your blog – I think it’s great what you are doing and it’s really interesting to read about your experiences and reflections. I like that you have posted these writing samples – one of my favourite things about working with Preps is to see progress over a year like you have shown with these samples. I like the idea of a writing checklist – I have a reminder on general display for the children to refer to but I want to try your idea for some of my more advanced writers who are now ready to make the process more personal. Enjoy the last four weeks of the term!! I would take all your children on this journey. To make our checklist we used Lane Clark’s deconstruction – criteria making jig saw. The children worked in groups looking at good pieces of writing. They identified what they saw and where they saw it. Each group presented their fingings and we kept a tally of the results. From all this information we formed a checklist. Many of these children could have formed the checklist without the inquiry, but it was actually powerful for them and the not as competent writers. It has helped this group enormously. It’s a great scaffolding tool and can be used to identify the main features of different genres. I’ve used the same process with Year 3/4 students as well. Thanks for commenting. Enjoy the last few weeks. Hi Nina, I love reading your blog. I have just gone through the very same steps to illustrate the writing process to parents of Preps 2010. Parents often ask how I plan a program and cater for the individual needs of their child. This is a perfect illustration of the progress a child can make in a year with carefully planned teaching sessions to support children with their learning. Well done. I’m all for it. And as I have commented before…that’s why I am still in Prep.